The design of the 2018 Audi S5 Cabriolet is unlike any other convertible. A wide stance and wave-design shoulder line wraps details like the signature aluminum accents on the windshield and Singleframe® grille into an eye-catching package that looks good rain or shine. The acoustic folding roof made with innovative materials to help absorb unwanted noise, the folding roof helps keep the interior comfortably quiet when the top is up, and folds at speeds up to 31 mph. Every line falls into place with a sharp, precise wave-design Shoulder line. Pronounced wheel arches highlight the standard quattro® all-wheel drive, while rear horizontal design lines and integrated brake lights accentuate the vehicle width. With a folding roof that can be raised at up to 31 m.p.h. 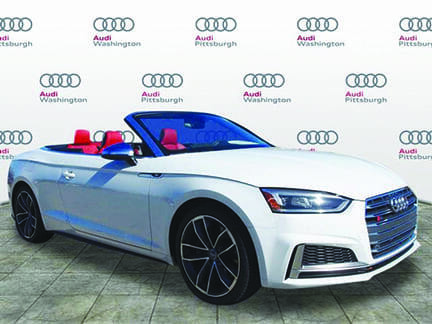 The 2018 A5 Cabriolet 2.0 TFSI® with a seven-speed S tronic® dual-clutch automatic transmission and a 354-hp engine, with 369 lb-ft of torque. Once inside the car, the seat belt extenders close for drivers to fasten the seatbelt and then retracts and an automatically Lombard support engages, placing what feels like a fluffy pillow in your lower back the instruments are perfectly arranged for easy access. Any and everything that you want to know about the weather, time, radio date, is clearly visible on the dash wing expansive style dashboard.